Here at Cherrydown Vets, we are offering free hay and health checks with our nurses, for local pet bunnies during this year’s National Rabbit Week, which runs from June 17 to 25. We are making the offer to encourage a greater awareness among rabbit owners of the importance of making sure their pets have plenty of hay in the diet. Every rabbit attending a health check will receive a free bag of hay. Kevin Wood, clinical director at Cherrydown, said: “Eighty-five to 90 per cent of a rabbit’s diet should be hay and they should eat approximately their body size in hay and fresh grass every day. “Rabbits will not eat soiled hay, so their feeding hay needs to be kept separate from their bedding and should freely available at all times. Rabbits produce a special type of poo – caecotrophs – which they eat. Feeding them plenty of hay means that this poo tastes as it should and encourages rabbits to eat it which is vital for their general health. He also warned about the dangers of providing rabbits with a museli-type diet. As well as leading to the problems caused by a lack of hay, they have shown to be severely detrimental to rabbits’ health by increasing the risk of obesity, dental disease, reducing water intake which can lead to urinary problems, an imbalance of vitamins and minerals due to selective feeding and slowing intestinal movement and increasing risk of gut stasis. 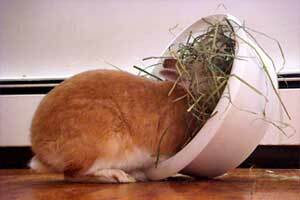 Switching a rabbit from a muesli to a hay and pellet-based food should be done gradually over 14 to 28 days. To book a free rabbit healthcheck call Cherrydown Vets on 01268 533636 or e-mail enquiries@cherrydownvets.co.uk. Next PostNext Snakes and adders are not a game!